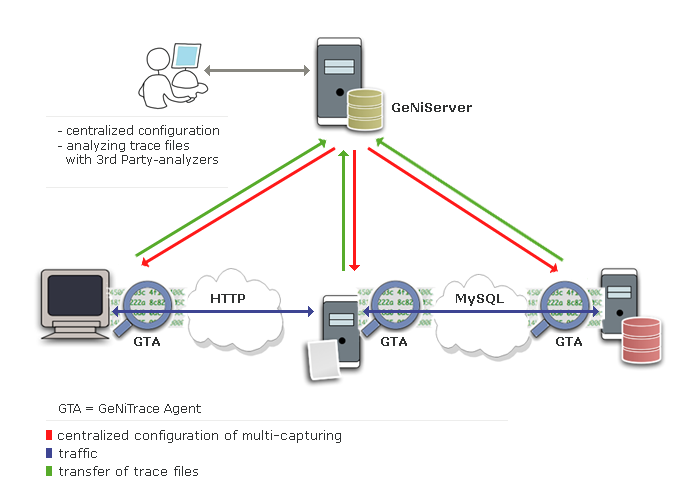 GeNiEnd2End MultiTrace is designed for remote packet capturing. Centrally controlled via web browser, network traffic is captured on any computer where a GeNiTrace Agent is running. Complex filter rules can be applied to capture only the packets of interest to diagnose complex network problems. The special challenge for maintaining complex IT environments is that they cut across separate IT silos. A business critical distributed application will often include a multi-tier application logic existing of a web tier, a database and a storage tier. Besides that the entire network is not managed anymore end to end due to selective outsourcing of wide area networks. Not to mention that devices like load-balancers, proxies and firewalls can be a source of trouble. In these modern IP networks one of the most complex problems IT managers face is diagnosing performance incidents across the different IT departments and service providers. Analyzing the root cause of distributed application issues requires knowledge and diligence. Is the fault caused by the local network, the outsourced wide area network, the application, the clients, the servers or is it something else impacting the performance? Such performance analysis is often very time consuming and requires packet captures from multiple segments of the network. With GeNiEnd2End MultiTrace IT professionals are able to troubleshoot performance issues by starting the performance analysis from the end user side. With the GeNiTrace Agent data is captured across the hops traversing the LAN and WAN between the end user and the application. Subsequently the captured data is analyzed by 3rd-party performance analysis tools like Netscout MultiSegment Analysis or ClearSight Analyzer which support merging of those capture files to create a multi-segment analysis session. These tools provide sophisticated multi-hop analysis and let you see how transactions propagate, as they travel through the network. This makes finding bottlenecks or other problems faster and more efficient. Instead of finger-pointing, it helps those responsible to expedite troubleshooting of performance incidents. With the coordinated multi-tier packet captures controlled centrally via GeNiServer the IT professional is able to capture the data as it travels through IP network and is in the position to isolate and solve performance issues quickly. So in case a response time issue is suspected, traffic can now be captured at the client and server side or somewhere in the middle at the same time using two or more GeNiTrace Agents. 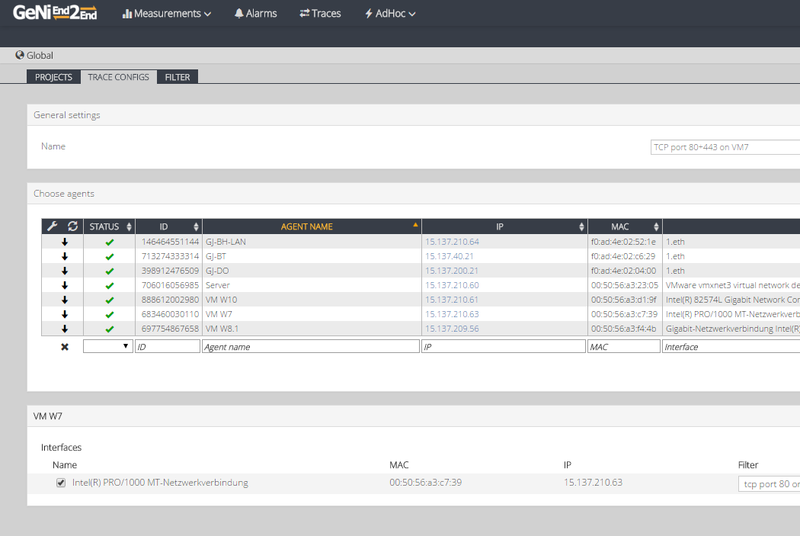 If needed continuous capture capability for analysis of intermittent application problems can be enabled.Via a web browser the IT professional manages centrally the GeNiTrace Agents, defines packet filters and determines the start and record time. After the packet trace session is finished, the multiple trace files are brought together for further analysis. 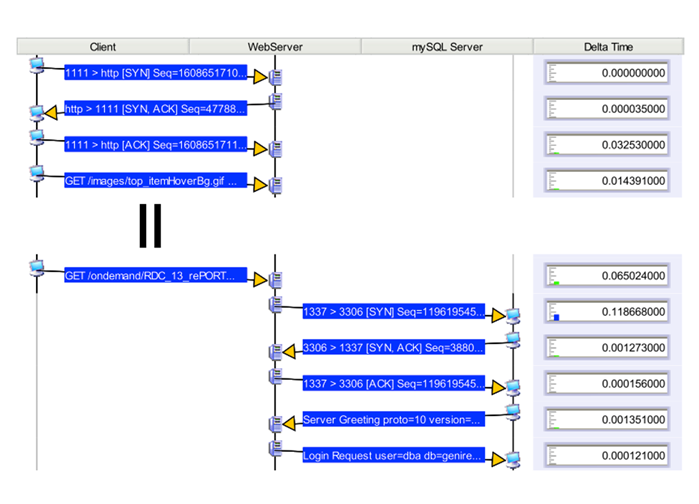 GeNiEnd2End MultiTrace in combination with a Multi-segment analysis tool provides network-tier visibility and allows isolating of performance incidents in complex IT environments. Hint: "Please Log in" is possible through a simple registration.